In this post, you will get a detailed overview of homeo remedy Syphilinum personality. I was discussing this remedy with some classes some while ago. When I asked the students which Nosodes they had prescribed, most said they had prescribed Carcinosin, Medorrhinum, and Tuberculinum fairly often, Psorinum less often, but about 90% of them had never prescribed this remedy. Never even considered prescribing it! When I asked why the answer was partly because they had never really understood it, and partly because they had an over-dramatized picture of it. In other words, unless an ugly deformed person with six fingers and drool running down their chin, they were not going to prescribe it. This is a fantastic remedy and if you are not prescribing it regularly you will not be getting as many people well as you could be. Here are some common personality features of Syphilinum! This may present in a number of ways and with varying severity. Anyone who will not walk under a ladder due to superstition has a touch of this, but for many it can come to limit his or her life. People who compulsively hand wash, people who compulsively check whether they have shut the door or turned the gas off might need this nosode. Two out of ten people suffer from OCD which can at times be crippling and can prevent the sufferer from leaving their house. At best it can take hours of the OCD sufferer’s time to complete the complex rituals they develop to deal with their anxiety. This is a complaint I treat a lot of, especially in children and adolescents. Any strong desire to control the environment usually signals a feeling of loss of control internally and is a cardinal sign for Syphilinum. There is often a strong fear of germs and infection. A superstition is a mild form of OCD, A lot of people might avoid walking under a ladder if there was an easy alternative, someone who go home and miss out on something they had intended to do because it would have meant walking under a ladder, and they need Syphilinum. I have a patient with a very large leg ulcer, an elderly lady, when I asked her whether she had managed to avoid the Flu this season she said , “ Oh yes, touch wood” whereupon she produced a small log from her handbag to touch. Superstition, as we have already mentioned, is a mild form of OCD and needless to say this lady got Conium and also Syphilinum with good effect. The destructive personality of Syphilinum! The destructive force is strong in a person needing Syphilinum, it may be an outward destructiveness, setting things on fire for example, but most often it will be a self-destructive tendency. We might see this in the family history with Alcoholism or drug addiction or in our patient themselves. Gambling is also an obsessive and destructive habit. Here might be a family history of suicide. The self-destructive tendency can be seen in any situation where the patient constantly sabotages their own efforts. An obese person who always breaks their diet, a person who is always late for job interviews, it could be seen in very many situations. If you see a patient who has had many accidents injuries or broken bones this may be part of the destructive energy of Syphilinum. I had a patient with very severe migraines who in his case history had suffered from three broken legs ( well he only had two legs but he had broken one of them three times!) a broken wrist, a broken collar bone, a fractured skull from a fall, a broken vertebra from a car crash. A serious eye injury from a firework and a dislocated jaw and the loss of two teeth in another accident! He was 22 years old. He got Syphilinum 1m once a week for a month He never had another migraine. Another who was constitutionally Ledum, but with a very pronounced Syphilitic Miasm which required several doses of this nosode who told me his history, he was very amusing and really made me laugh although his tale was really anything but funny. He related that as a boy of 10 he had fallen out of a window and impaled himself on railings, he was trapped by the thigh and had to be cut free. He was in a wheelchair for a while and his sister was pushing him down an incline when a wasp flew down her top and stung her. She let go of the wheelchair and it sailed down the hill, straight up a path and through a plate glass door. He broke both arms and suffered multiple lacerations. Later in life, he managed to get himself stabbed twice, once in the arm with a Stanley knife in a dispute over a bag of chips and once during a mugging. He had also had an industrial accident where he had been stapled to a wooden bench with a nail gun, ( you could not make it up). His presenting complaint was cluster migraines which were agonizing. He was bordering on Alcoholic. I think you can see where the Ledum and the Syphilinum come in. In remedies, we often see the idea of polarities, remedies that are in the rubric ‘low sense of self-esteem’ for instance might also be in the rubric for Haughtiness. The opposite polarity to Destructiveness is Creativity, and so we see a lot of creativity in people with a strong syphilitic Miasm. Often drawn to drama, music, or painting they may combine the ability to create beautiful art with a major tendency to self-destruct. In the history of Art, Literature and Entertainment we can see huge numbers of people who have died early either from violence ( accidental or deliberate) or suicide. In this century, we could cite Buddy Holly, Jimi Hendrix, Jim Morrison, Michael Hutchence, Kurt Cobain, Janis Joplin, Marvin Gaye, James Dean, Marylyn Monroe, Judy Garland, River Phoenix, Heath Ledger, Jayne Mansfield, Sylvia Plath. The list is endless. In previous centuries, we could cite, VincentVan Gogh, Edouard Manet, Ludwig Van Beethoven, Robert Schumann, Franz Schubert, Gustave Flaubert, Guy de Maupassant, Oscar Wilde. It is said by some that in the 18th Century some artists actually tried to contract Syphilis as they believed it would bring, along with the many terrible symptoms, a Muse who would enhance their creativity. The ugly personality of Syphilinum! This is the impression we get from the old books, Deformed, Stunted, Smelly and obscene. We might expect to see Hutchinson peg teeth, a flabby bag for a nose. Yet look at the list we have made, including Marylyn Monroe and Judy Garland Vivien Leigh and Jayne Mansfield Most of these troubled stars of stage and screen were exceptionally beautiful. Princess Diana is another example of this. She was certainly beautiful, with a history of depression. A history of forming unsuitable relationships of being obsessive (100 calls in one day to Oliver Hoare) She had a history of Anorexia and Bulimia and died tragically in a car crash at the age of 36. We can recognize this external beauty with internal destruction as the hidden phase of Syphilis. After the primary lesion, the disease goes inside, leaving no external sign of the havoc it is wreaking. Many Syphilinum patients present with depression. They have darkness around them. They are unavailable to get in touch with any joy in their life. There may be many shades of self-destruction in someone with depression from self-harming to suicide , the ultimate expression of self-destruction. One of my very depressed patients who had been given Syphilinum told me when he returned for his next visit that is felt as if he had taken a heavy black cloak he had been wearing for a long time. The isolated personality of Syphilinum! This may be part of the depression but it can be seen in someone without depression. They are often people who feel outside of the crowd. They feel like they don’t belong. I have seen many patients who require this nosode who feel that there is a glass wall between them and others, a symptom which can also be found in the remedies Anacardium and Thuja. Syphilinum is a remedy for the Heart Chakra and as such we can see them having difficulty in forming open and trusting relationships with others. They can feel unwanted, unloved and suspicious of the love that others might try to show them. At the extreme end of the scale this could make them misanthropic loners, but more often we can see that they never feel fully connected to another person and this can make them feel very lonely. The secretive personality of Syphilinum! Syphilis hides itself. After the first stages of contagion, it disguises itself and up until the development of the Wasserman diagnostic test it was very difficult to diagnose. It also hides by being accompanied by a sense of shame. You might ask your patient his or her family history and learn that there was Heart disease and Cancer; they might possibly know that an uncle had TB, but most people will be blissfully unaware that Granddad had Syphilis as the fact of the disease has been hidden. Researchers of Syphilis were hampered by both of these facts. The patient requiring Syphilinum as a nosode might also be secretive, partly due to their lack of trust in others, partly due to a feeling, like Thuja, that if you knew what they were really like you would despise them. The self-loathing of Syphilinum can lead them to hide their innermost thoughts and feelings from others so that in consultation they come across as very closed and secretive and very guarded. Most of the problems that beset this remedy are worse in the hours of darkness between sleeping and waking. It may be pain that wakes them in the night. It may be an inability to sleep. It can sometimes be an aggravation in the mental state where the patient is very anxious or depressed. Any problems that are significantly worse in the night should make you think of this remedy. Here are a few things, either currently or in the history that would make me consider a dose of Syphilinum. Recurring tonsillitis is a pointer towards this nosode, anyone with a history of severe throat problem, and possibly a resulting tonsillectomy might be helped by it. Especially if there has been a Quinsy or tonsil abscess. I have even treated acute tonsillitis with Syphilinum. My friend who is a Homoeopath had a sick teenage daughter, She had been unwell for a week and was getting worse. Her throat was so painful and swollen she could not even swallow her own saliva let alone food or drink. Her breath was absolutely foul and she was dribbling all over her pillows and waking herself at night. Her mum had given her Mercury in various different strengths and even tried Merc Iodatum rubrum. Then she went onto Hepar sulphur and then offered her daughter antibiotics. The Daughter said no to the antibiotics and they called me. When I entered, the smell in her room was absolutely foul and after taking the case I could not see why Merc Sol was not working. I prescribed Syphilinum 200 once every four hours and suggested they repeat the mercury the following day. They called me around 11 the following morning to report those 24 hours after starting the Syphilinum. She was so much better that they felt they could just leave it to work and she got better within a day or two. There is not a lot written about the skin complaints of this remedy apart from ulceration and fissures both of which are certain pointers to this remedy but I also made a discovery about this nosode and Eczema. I had a patient, a little boy of three with very severe eczema I had given him a lot of remedies and he was only slightly better. I was at a bit of a loss as to what to do next. He was very severely aggravated at night, so his parents were getting no sleep. It was all over his body and his face was so severe he looked like a burns victim. I decided on the severity of the nightly aggravation, to give a dose of Syphilinum. I repertoire and in doing so I looked up Eczema in the skin chapter, Syphilinum was not included in the general Eczema rubric. I was desperate so I gave it anyway while I worked some more on the case. When he came back to see me a month later, I could not believe it was the same boy. His parents reported a huge improvement within days of taking the remedy. The improvement was all over but had started with his face. I was delighted of course, but it was somewhat unexpected. I looked up Eczema in the face chapter and there it was, Syphilinum in italics- who knew? Certainly not me! Since then I cannot tell you how many severe eczema cases I have helped with this nosode. (Well I can- about 20). They have all been longstanding cases, affecting the whole body with a particular aggravation on the face. They have all been reported as “tearing’ or ‘raking’ at their skin in a desperate and destructive fashion. There is a significant nightly aggravation and their sheets are usually covered in blood in the morning. As well as Eczema remember that Syphilinum skin may present with Ulcers (anywhere), Fissures, Fistula and rectal or genital Warts. Herpetic lesions anybody who suffers from cold sores anywhere on the body will get a dose of Syphilinum from me at some point in their treatment. I think the herpetic ulcer is a representation of the original Chancre. Bloody discharges would alert me to the presence of this nosode. This could be a chronic discharge, such as a bleeding ulcer, or Psoriasis which bleeds easily, or it could be an acute discharge. An ear infection with a bland discharge might need Pulsatilla amongst others, but if the discharge becomes streaked with blood were looking at the Syphilitic miasm and associated remedies such as Mercury or Hepar Sulph. Whilst on the subject of ear infections it can be a remedy where the ear infection has become chronic and when this happens the ossicles can get destroyed by the infection. I think it stands to reason that if our problems are self-destructive this could manifest in our Body destroying its own tissues, which is what is happening when our system makes antibodies against our own tissues or secretions. Guttate psoriasis: This is an acute form of Psoriasis which usually follows a severe streptococcal infection of the throat. The Guttate (which means droplet) psoriasis develops mainly on the trunk in tiny patches. It will typically last for three to six months and then spontaneously resolve. I believe this is an attempt by the body to throw off or weaken the Syphilitic miasm. Syphilinum may useful for any psoriasis. 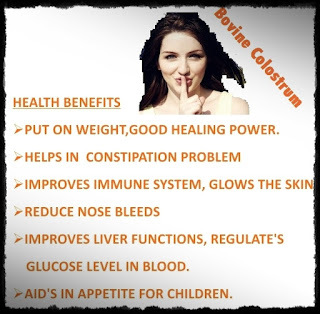 Bovine Colostrum got amazing benefits for human health. Colostrum is the first milk any mammal including human, cow, goat, horse produces after giving birth. It is full of antibodies and a lower grade protein that is more easily digested by the newly birthed creature. You need to feed it to them the first 24 hours. You may bring a colostrum product that was supposed to be healthy and natural, to help you with your chronic fatigue or autoimmune disorders. You can try to get a couple ounces to start, now some will take more just depends on, and then every 3 to 4 hours you can feed again. Each time they are stronger and take more. You may keep colostrum a year in the freezer. Just like freezing food, the more care you take with collecting and packaging, the better it will keep. So clean hands or latex gloves on a clean udder, clean bucket or cup or bottle for collection, and clean storage container. A package rated for freezing and tightly sealed against air exchange is a must. Nowadays if you live in a chaotic lifestyle and want to keep a good health and immunity, it is a quite a difficult task. It is common to suffer in allergies, asthma, depression, cardiovascular diseases, and cancers in such an artificial lifestyle. If you want to avoid these troubles, you need to facilities yourself to seek assistance in nature. One can get rid of these problems by adding a regular exercise, organic foods and natural supplements in your daily life. 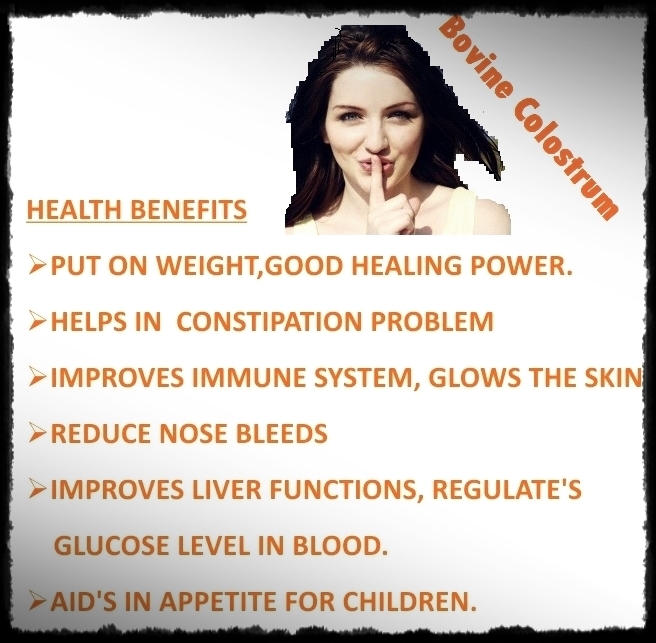 Top 10 Health Benefits of Bovine colostrum! Immunoglobulins: This is so essential for proper metabolism functionality; this is an antibody plays an important role against a variety of disorders, including cancer cells. Lactoferrin: The presence of Lactoferrin in cow colostrum helps to keep red blood cells healthy for long in the body; it also prevents the growth of bacteria and has important antibacterial, antifungal and antiviral properties. Lactoferrin plays an important role in all kind of infections, diseases, allergies, cancer, and tumors, suppresses burnout and chronic fatigue syndrome. Anti-aging properties of cow colostrum make your skin glow and bring an attractive charm in your overall personality. It provides a regeneration power to stem cells that’s the reason it helps healing wounds so rapidly. Bovine colostrum contains good vitamins for hair health, it also used in various cosmetic products. A regular use of colostrum powder makes your skin healthy and your hair shiny. Bovine colostrum benefits include rapid muscle development during bodybuilding, in Australia it’s the top ranking and most favorite natural food supplement for all athletes. You may already read several stories and testimonials about colostrum by Australian sportspersons in various newspapers. PRP molecules: Cow colostrum contains a group of molecules called PRP: it is a powerful regulator of the immune system. It boosts up the functionality of pituitary gland, also a useful natural remedy for a powerful memory. Slowing aging: Natural growth factors are very important for the growth of a child and for general tissue regeneration and wound healing, and the presence of these factors in colostrum are very useful for slowing aging. Minerals and vitamins: Bovine colostrum is rich in multivitamins and essential minerals and it make the colostrum even more important and health-promoting substances for energy seekers. Vitamin C, B, D, folic acid, essential minerals such as selenium, sulfur, zinc, potassium, phosphorus and many other makes the colostrum a powerful natural supplement. The colostrum is available as a dietary supplement in the form of tablets or powder. Naturopaths recommended it mainly for immune support, so it is suitable in cases of frequent bacterial and viral diseases, or if you have any disease which is linked with a weaken immune system. Colostrum is a very valuable natural remedy to provide strength and energy during recuperation or any mental and physical exertion. The use of colostrum is also useful for prevention of gastric ulcers, cancers, tumors, toenail fungus, candida die-off, cardiovascular diseases, chronic infections and troubles of the digestive tract. When cows give birth, their first milk is extracted and pasteurized into milk powder for human consumption. Cow colostrum is 20 times stronger than human colostrum in term of the immune system. There's so many companies marketing colostrum and claiming to be beneficial. In actual fact, it doesn't do much at all. Though it contains higher antibodies but the antibodies don’t seem to be very active in human bodies. There is some truth in building immunity with cow's colostrum. Under certain conditions certain children might need it, so let’s not intimidate this life-saving gift of nature. But if your child is healthy why to go for it. In Australia its practitioner only supplements. Mother Nature perfected human Breast Milk for a human baby, which is also the same reason why formula milk is harder for babies to digest because they are meant for a calf. Does cow colostrum is good for infants! Cow colostrum has 15 years history in china market and last year September government just makes a call to ban cow colostrum in infant formula. China used to be the world largest bovine colostrum consumer, what do you think the ministry of health making such a prohibition? Mother's milk is the most natural and nutritious food for baby. Babies fed with breast milk have shown to have a better immune system why need to supplement the baby if a baby is growing well? Human relies too much on technologies and apparently they have forgotten their roots and sadly they not confident in their bodies. But breast milk for sure is the best for your baby as it's not processed. Those milk powder, canned milk or pasteurized milk already processed. Why would we feed our baby processed food at such young age? I don't think a mother's diet will be worse than any processed food out there. Why would we give human baby a goat's milk? Shouldn't it be human for human? I know your MIL meant well, but sometimes we must take charge, and put your foot down. Be firm and believe in your own principle. This is your baby, and you're the mother. I’m sure you read enough, asked enough and know enough about breastfeeding. To me, colostrum is also milk. It comes from the same tap doesn't it? Difference is, colostrum is the beginning of liquids packed with nutrients designed especially for newborns and the matured milk will come eventually as the baby grows older. That's the basic concept. Well, if you want to read more on that, No goat, cows milk even water or honey back to basic. Mother own milk is the best option for her baby. You give into your milk, or stand firm, it’s your choice, and it’s your baby. Stay strong and happy breastfeeding mom. Hence there are not proven evidence of colostrum supplement side effects yet but still many doubts it cause candida die off. I am bottle feeding two lambs now. They are 3 weeks old. I go outfeed every 6 hours but getting ready to reduce to 3 feedings. They are eating creep feed and eating hay. They are eating about 12 ounces each feeding. I buy a lamb milk replacer for these feelings. I only use a lamb replacer. There are multi-species replacers available but it is best to stick to lamb only. It is so critical to get the good stuff in them that first 24 hours. They do make powder colostrum too. I also hand milk a few high producing gentle beef cows each calving season and freeze them colostrum to use for any calf too weak to nurse their mother. It's important to make sure each calf receives, at least, a quart of this liquid gold within 12 hours of birth. I have used very old colostrum (2 years) but I make sure the calf also gets a pint or two of fresh even if I have to go to the neighbor's dairy or mug a cow of my own to get it. We used to rely heavily upon heat lamps and towels to get wet newborns dry, but have since switched to these blankets. The blanket retains the lamb's body heat so that it stays actively looking for the teat instead of just hunched up shivering under a heat lamp. And any shepherd will tell, colostrum is life to a newborn lamb, especially when temperatures dip below freezing. We have found that covering the lambs is less work and more effective for getting lambs through those first critical hours than towel drying and heat lamps, plus safer too. Every year I hear of barn fires caused by heat lamps. Besides that, who wouldn't think a lamb I plaid coat is adorable to boot. In homeopathy there are several remedies made from animal’s milk including Lion’s milk, Wolf’s milk, Horse’s milk, Lac felinum, Lac caninum, lac defloratum. These are very useful remedies and give great results in several ailments. Hahnemann writes about the importance of good nutrition in healing so I see good nutrition as part of homeopathy. Good nutrition offers the right building blocks for the job. Unfortunately, it's often poor diet and unhealthy thought patterns which create the problem to begin with, so it goes without saying that this is what must change (in addition to using homeopathy) in order to not recreate the original situation. I think what many people fail to understand about Homeopathy is that its capacity to heal cannot always be pinned down or explained logically. It very often just fills and minds all those nebulous gaps and cracks that fall In between various other established methods of cure. 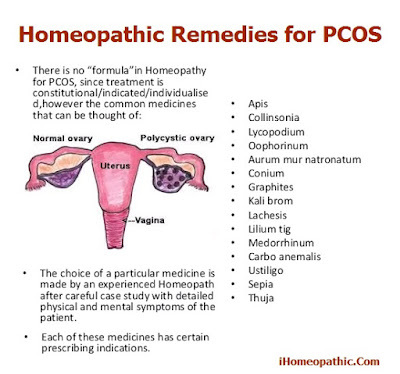 Are homeopathic remedies effective for PCOS? Yes chocolate, bilateral and polycystic ovarian syndrome can be cured by homeopathy and the cure is permanent without any surgery or side effects like unwanted hair, hair loss, weight gain, menstruation problems, infertility, thyroid problems, delay in pregnancy, etc. Homeopathy is a purely natural treatment having no chemical formulations, by following a simple diet plan with homeopathic remedies any women, married or unmarried could easily get rid of PCOS permanently. A good homeopathic doctor can easily collect the particular symptoms of a remedy during case taking and can be prescribed the right remedy. It is case to case need individuality. Homeopathy is the only system that looks at the whole person and not just at the individual parts of the body. If you don't know what PCOS is read into it? It can be painful at times and cause lots of problems. It's a hormone imbalance so yes your hair might be darker. The more you weigh the worst it can be and it's hard to lose weight when you have it. PCOS or PCOD is a complex condition, involving thyroid dysfunction, which affects ovarian function, insulin production, weight regulation and more. In most cases of Polycystic Ovary Syndrome (PCOS), etiology is unclear etiology, and there is still not an obvious perceptive about its any link to the genetic background. Approximately half of the women with PCOS are failed to get insulin resistance and this is not included in the diagnostic criteria. Now researchers are trying to improve PCOS diagnosis and treatment methods to cover greater risks of infertility, endometrial cancer, disorders of sugar metabolism and cardiovascular diseases. Today the term polycystic ovary syndrome is based on the description given by Stein and Leventhal, who first declared that women with polycystic ovaries are usually facing cycle disorders, bearded chin, infertility, hyperandrogenism, and obesity. Mostly neuroendocrine disorder causing to increased the pulse rate and high amplitude frequency of LH are also noticed. Huge chances of failure of ovarian androgen biosynthesis. Boost up the activity of the opioid system and reduced the production of SHBG. Failure of insulin secretion leading to insulin resistance and hyperinsulinism. It may bring a change in cortisol metabolism leading to increased adrenal androgen production. Pregnant women with PCOS are usually facing the following risks. More frequent spontaneous abortion (the risk is higher by 30 - 50%). Appetite loss or increased hunger is also noticed in several cases. There may need of neonatal intensive care unit after the birth. 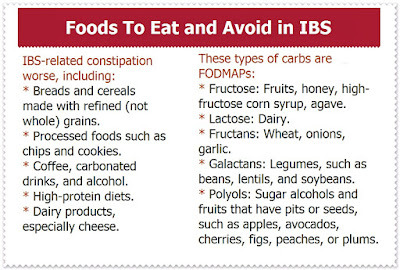 PCOD or PCOS treatment also include the control of the metabolism of diet and exercise. Reduction in body weight in overweight women is the chief healing measures. Metformin is a substance used for decreasing insulin resistance and its high levels. Metformin recovers the ovarian function and improves the effects of other drugs that are used to stimulate ovulation. In PCOS women, unwanted body hair is removed by ordinary cosmetic hair removal methods. It is also a proficient use of hormonal contraceptives, which both decreases the objectionable consequence of male hormones and help in regulates the menstrual cycle. If the traditional treatment does not make the grades, it is possible to use surgical methods. Symptoms and sign of PCOS! Some major symptoms during or before noticed in PCOS cases are listed below. If you got few of them at the same time, it’s an alarming situation. Contact your general physician or the best homeopath in your area. PCOS - what is the treatment used in Homeopathy, how does it work, and is the condition curable or only able to be controlled? The treatment used in homeopathy is based on a whole consideration of the patient. So for e.g. in PCOS which is a polycystic ovary, all the symptoms of the patient will be taken into consideration before deciding the remedy. This may include mental and emotional condition of the patient, also details about the Appetite,(food desires, aversions) Sleep, eliminations(motion, urine, sweat etc), aversion symptoms, etc. whether the person is warm or chilly, all the symptoms of the disease also will be taken into consideration. Hence, you see there is no ready-made remedy for every condition but every case is a new challenge. The medicine works on a well demonstrated but very little known law of nature called the "The Law of similar". The medicine works by stimulating the innate immune mechanisms of the ill person. Yes, PCOS is curable by good quality homeopathy. I have treated many, and many with PCOS. I get them to go on a Gluten Free, Dairy free diet; it is essential it’s GF as the Gluten mimics the antibodies and continues to attack the thyroid gland. I give Thyroxine in potency 6c usually. I also use New Vista Thyroid liquescence and a good Omega in the evening at bedtime and a very low GI diet. 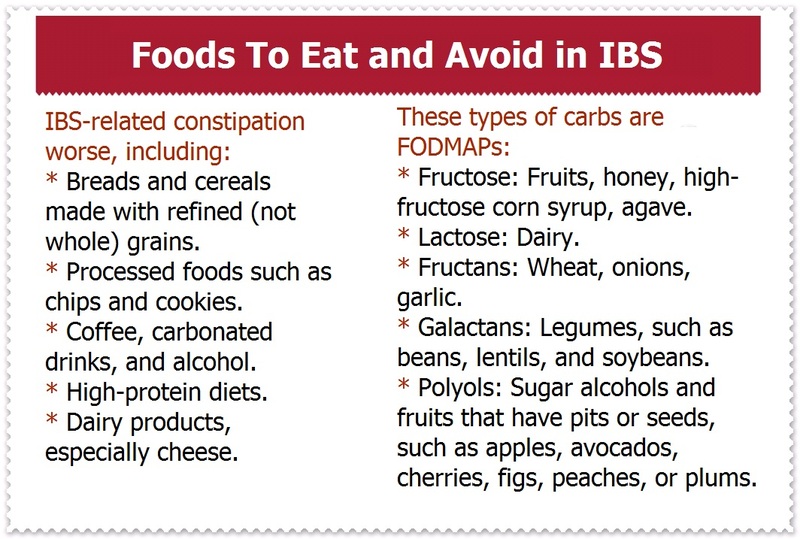 Patrick Holford has a great book on PCOS and how to treat it diet and nutritionally. I use Ginseng and Turmeric and pro-Green powder or chlorocaps something along with homeopathic remedies to help the inflammation. Folliculinum: This is the best remedy and gives absolute results when there is a history of birth control pills found in the patient. These contraceptive pills bring disgusting abnormalities in female hormones level and in results they are facing problems like rapid weight gain, hirsutism and ovaries cysts. Pituitary Gland: This is a nosode remedy, it works awesome when we find a major disturbance in pituitary gland along with PCOD, and you may also use this remedy in 30c along with other remedies as a complementary remedy. Thallium Metallicum: PCOS problems along with thyroid dysfunction, myelitis, and adrenal fatigue are calling for Thallium. In this remedy, the patient got unbearable pains like an electric shock. Natrum Muriaticum: Natrum Mur is a suitable remedy for loyal women, who like long baths of fresh water, do not like sympathy and eagerly eat salty foods. Thuja occidentalis: Chances of getting pregnant with PCOS is always low especially when there is a history of bad effects of any vaccination. Thuja is our best homeopathic remedy to eliminate all type of vaccination side effects and give a hope of pregnancy to PCOS women. Aurum Metallicum: The Polycystic ovarian syndrome with a great depression and anxiety, the patient got suicidal thoughts all the time, she loses interest in living. She got a relief by putting warm objects like iron on belly during cyst pains. Apis Mellifica: Women of this remedy cannot tolerate to heat, working in the kitchen is always very difficult to them. Their complaints got aggravated by heat and they feel relax in cold. Normally patient tongue is bright red without thirst and got pains like bee stings. Pulsatilla Nigricans: Another commonly used remedy for the ovarian syndrome, Pulsatilla women are easy to recognize. These women are a bit flirty type, like sympathy, like fried foods and baked items, normally having no thirst, start crying over little matters, moveable pains, pains starts slowly but goes suddenly, like fresh air and cannot tolerate heating. Thyroidinum: PCOS associated with hyperthyroidism and thyroid nodules come under this remedy. This is also a nosode remedy so do not repeat it frequently. Lachesis, Lycopodium, Medorrhinum, Sepia, Adrenalinum, Thallium Met, Lilium tigrinum, Collinsonia Canadensis, Ashoka, and Sabina or also remarkable homeopathic remedies used for PCOS treatment. Natural and Ayurvedic herbal remedies offer useful prospects to improve the health condition of women suffering polycystic ovarian syndrome. Also, keep in mind that all the home remedies are given on this page are supporting remedies and most of them may already available in your home kitchen. These herbal remedies are may not fully cure your disorder but by adding these natural foods in your daily diet will surely give you a lot of health benefits and improve your immunity as well. 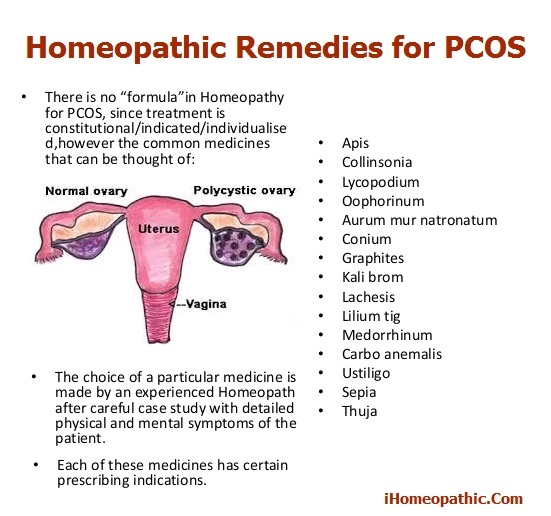 Indian gooseberry, spearmint tea, bitter gourd, holy basil, flax seeds, apple cider vinegar, honey, cinnamon, fenugreek, saw palmetto, chaste berry, turmeric powder is the most important home remedies useful for PCOS. It is important not to exceed the dose and take these herbs only when needed. Overdose or frequent doses of these herbs can cause side effects such as mood swings, stomach upset, nausea, vertigo, and depression. An early diagnosis of polycystic ovary syndrome in women minimizes the treatment and further issues related to this disease. The aim of homeopathic treatment is not only to regulate the menstrual cycle, ovulation, and pregnancy implementation but it compensation for other serious health disorders that go together with this disease. For patients with polycystic ovaries who are looking for a homeopathic assistance, it is imperative to know that a fully developed picture of the syndrome prevents natural pregnancy without former hormonal stimulation of the ovaries. It is important that the homeopathic treatment for PCOD started timely and follow all the instruction given by your physician in a correct manner or your disease can lead to serious tricky situations, including everlasting infertility. In homeopathy each patient is required an individual approach because there is no specific remedy for any disease, a remedy is always chosen according to the symptom, and it is very important to build a good therapeutic relationship between physician and the patient. Desired goals that are expected from homeopathic treatment could be gain from a good cooperation. If you ever applied homeopathy for PCOS, kindly share your reviews about the treatment.